Seven times a day someone in this country dies in a home fire, most often occurring in homes that lack working smoke alarms. A smoke alarm almost doubles your chance of surviving a home fire, one of the most common disasters in the U.S.
As part of our Sound the Alarm. Save a Life campaign, the American Red Cross is actively recruiting volunteers to install smoke alarms in high-risk neighborhoods throughout the Northwest Region and across the United States. Carol Warner, a part-time Snohomish County resident, recently read a notice in her local newsletter about a Sound the Alarm event coming to her neighborhood, and signed up to have a smoke detector installed in her home. Specifically, she requested an alarm designed to assist the hard of hearing. Carol is hearing impaired. She is unable to hear much when her hearing aid is removed for sleep, though with the aid of a recent cochlear implant, she is starting to relearn sounds she hasn’t heard in 30 years. On a recent trip back to her 50th high school reunion, Carol realized she was unable to hear the alarm clock in her room. What followed was a sense of panic, knowing she would not be able to respond to emergencies where sound is the typical warning. Carol now recounts the “wonderful day” that Red Cross Sound the Alarm volunteers arrived at her home to install her Hard of Hearing alarm. It has a vibration notification appliance that can be put under a bed pillow or mattress and is activated by the sound of more traditional smoke alarms. After giving it a test, she confirmed it was “a godsend and so wonderful.” She recounts sharing big hugs with the volunteers before they left, feeling more at ease knowing she would be alerted if the smoke alarm ever went off. 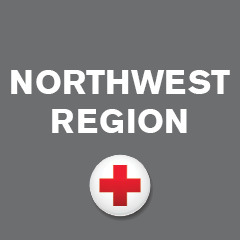 In the Northwest Region, the American Red Cross and its partners have installed 10,275 smoke alarms, replaced approximately 667 smoke alarm batteries, made more than 3,163 escape plans, and reached thousands of youth with preparedness information. Volunteers are needed! Join the American Red Cross to Sound the Alarm. Save a Life.